Scientific and practical projects in relation to forming projected fuel and energy balances, forecasting energy consumption and research on energy efficiency of the economy have been part of ERI RAS’s work since its foundation, and have always been a priority. Initially work on the fuel and energy balances relied on the methodical results of A.A. Makarov and A.G. Vidorchik; the methodology was based on the “standard method” of calculating energy consumption (per unit consumption of energy resources times full size production of main product types) and consolidation of energy balances of specific fuel types into an aggregate balance of so called boiler and furnace fuel . With the arrival at the Institute of the leading specialists from the State Planning Committee of the USSR (P.K. Aksyutin) and its computation centre facilities (led by T.V. Kleinik), ERI RAS specialists were able to develop a methodology for forming an aggregate balance of primary energy resources and some relevant simulation models, which translated domestic data into a single fuel and energy balance template, produced by the United Nations Economic Commission for Europe (with ERI RAS’s participation). In recent years this area has been developed by the Corresponding Member of the Russian Academy of Sciences S.P. Filippov, Doctor of Technical Sciences A.N. Kurashev and E.V. Mokhin. It was in demand for solving various practical tasks. The most important of those were the preparation of materials for the development of the Energy Strategy of Russia for the period up to 2030, forming fuel and energy balances of the subjects of the Russian Federation in agreement with the national fuel and energy balance, analysis of energy efficiency of the Russian economy and its individual sectors. In the latter case it was essential to form a fuel and energy balance in the international format, based on Russian statistical data. As the structure of the tasks expanded, it became necessary to develop modelling and information tools of a new generation. 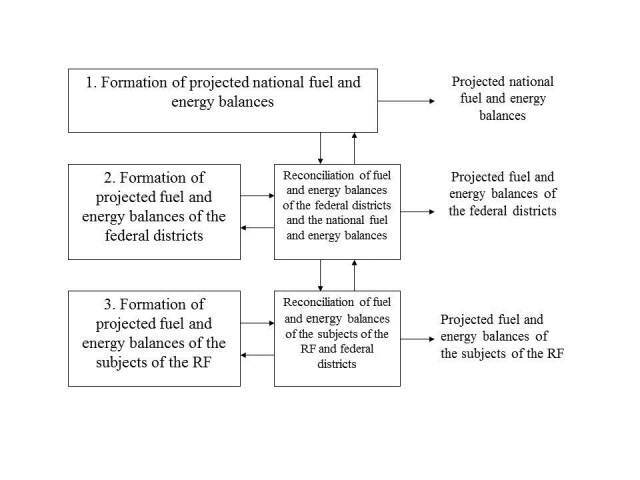 5)	Simulation model for forming an integrated (mutually co-ordinated) system of projected fuel and energy national and regional balances, with a breakdown by federal districts and subjects of the Russian Federation. The methodology for preparing fuel and energy balances in the international format developed at ERI RAS takes into account the specifics of the structure of the Russian energy sector and the economy, the structure and quality of statistical data collected in Russia. It also ensures consistency with the national statistical data. 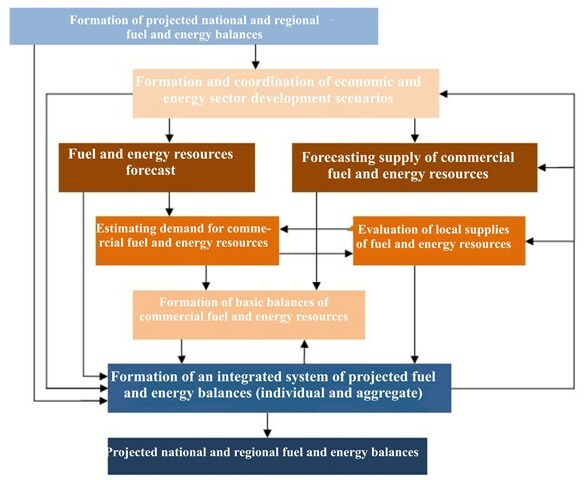 Four sectors are differentiated within the structure of the balances: production of fuel and energy resources, transformation of fuel and energy resources, consumption of fuel and energy resources for own needs and losses in the fuel and energy sector, and final consumption of fuel and energy resources. As a result the fuel and energy balance became an effective instrument in the system for substantiating decisions being made, not only for the receipts but also for the expenditure side of the balance. This is particularly the case for evaluating the effectiveness of decisions and their long term consequences. 3) fuel and energy balances of the subjects of the Russian Federation. Fuel and energy balances at the lower hierarchical levels are developed in co-ordination with the fuel and energy balance of the level above. Thus solutions are vertically reconciled. Here fuel and energy balance of a higher level has priority in the reconciliation procedures. However, adjustments can be made to it given valid reasons, i.e. there are reverse interrelationships in the flowchart of forming the system of fuel and energy balances. Horizontal reconciliation of solutions also takes places at the second and the third hierarchical levels: at the second level fuel and energy balances of the federal districts are mutually reconciled; at the third level – fuel and energy balances of the subjects of the Russian Federation are reconciled with fuel and energy balances of their “own” districts. The top-down principle of forming fuel and energy balances is implemented within the proposed flowchart. This ensures methodical unity of forming a system of projected national and regional fuel and energy balances. Projected fuel and energy balances are also formed based on a unified information basis for the same external scenario conditions. As a result the proposed flowchart ensures a system of mutually reconciled and coordinated projected national and regional fuel and energy balances. It increases flexibility of solutions for predicted tasks. If required, only one (national) or two levels (national and federal district level) can be used, which reduces the scope of predictive work manifold. •	Development prospects of municipal entities and relevant energy consumption forecasts. Possibilities of using local fuel and energy resources can also be taken into account; for example, local fuel resources and renewable energy resources located in the region. The most complicated tasks in the formation of projected fuel and energy balances are those of predicting demand for fuel and energy resources from the end-use consumption sector. This is due to a vast number and a great range of end-use energy consumers and a complex description of their consumption patterns. The task of structuring the end-use energy consumption sector is solved based on initial (input) information and its quality. Classification of the types of economic activity is taken as the foundation. Results of mutually agreed economic and energy sector development scenarios are used as external parameters for forecasting demand for fuel and energy resources from the end-use consumption sector. An integrated approach to forecasting end-use energy consumption gas been proposed. It combines forecasts of specific energy characteristics of types of economic activity made using analytic and statistical methods with development forecasts of the types of economic activity. An important feature of this approach is its orientation towards prevailing use of statistically observed data which is subsequently thoroughly analysed, verified and mathematically processed and visually represented. 3) selection of large investment projects to include these in the forecasting procedure and determining their economic (production) and energy characteristics. The first task is resolved by establishing quantitative links between energy intensity of the types of economic activity with external macro-economic parameters. The second task is resolved based on the methods of technical and economic analysis of competing energy saving and energy replacement technologies and measures in the end-use energy consumption sector. The impact of large investment projects on energy consumption is assessed using a relevant expert analysis. 3 – taking into account disturbances caused by the implementation of large investment projects. 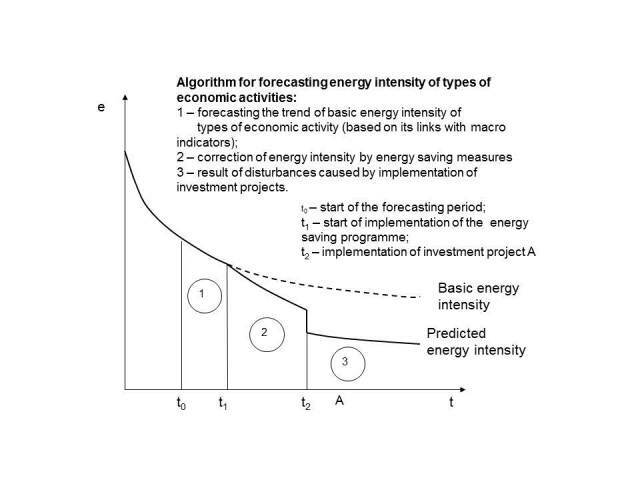 Picture 3 – Forecasting energy intensity of types of economic activity. 2. S. P. Filippov. Forecasting energy consumption using a complex of adaptive simulation models //Izvestiya RAS. Energy. – 2010. – № 4. – С.41-55.